Aimé Césaire was a Martinican poet, humanist and political figure who co-founded the movement of Negritude, along with fellow Martinican Léon Gontran Damas, and the first president of Senegal, Léopold Sédar Senghor. 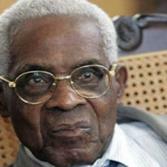 Aimé Fernand David Césaire's writings were incorporated in high school and university curricula in many Francophone African countries. He was regarded by millions as one of the most honorable advocates of the African diaspora. Some of his most celebrated writings include "Discours sur le colonialisme" (Discourse on Colonialism), Cahier d'un retour au pays natal (Chronicles of the Return to My Native Land), La Tragédie du roi Christophe (King Christopher's Tragedy). He passed away on April 17, 2008.